My blogging has suffered in the past couple of days, so now I will catch up. 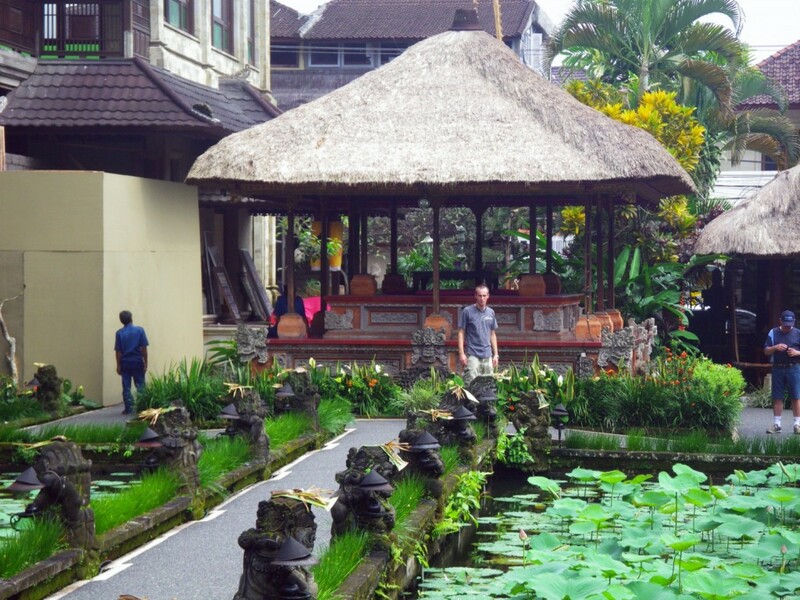 Friday, we hired a driver named Rama (ramahomestay@yahoo.com or 081 805405565) to take us in his SUV to the town of Ubud. Along the way we stopped in some little towns known for their markets (Sukawati), their wood carvings (Mas), and their paintings (Bantuan). When in the busy town of Ubud, the traffic was pretty intense, (and never really subsided the entire way up there), and the shopping was endless. 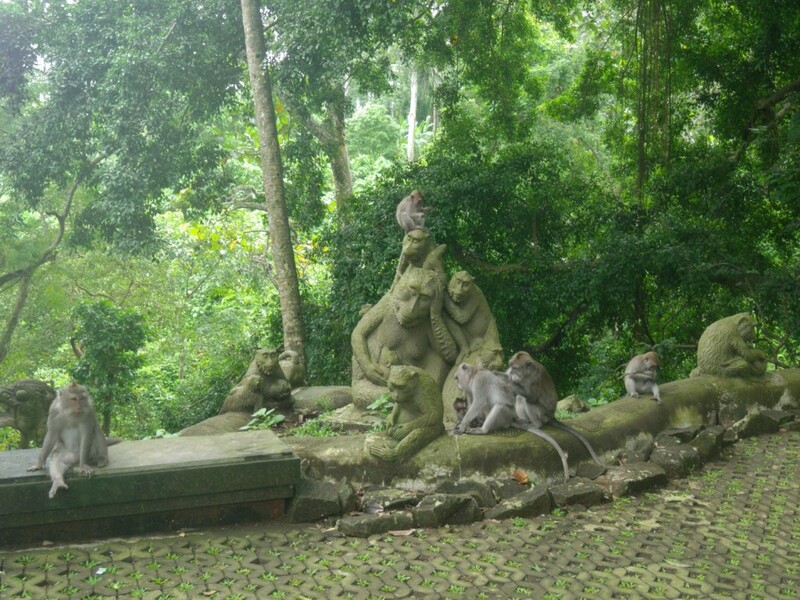 We saw the Royal palace and water gardens, and the monkey forest before taking a LONG detour up to Lakeside Restaurant. The draw here is the view, but it was socked in due to clouds and pouring rain, so we got one decent picture and ate a horrible and overly-priced buffet lunch (at 4pm) before plodding back to Canggu through 2.5 hours of traffic. It’s a good thing Rama had a DVD player for us to at least keep part of our attention off the road. When it rains here it pours, and that’s what it did the whole way home, wth crashing thunder and wicked looking lightning. Rama was a very cautious and attentive driver and we made it home tired but happy. 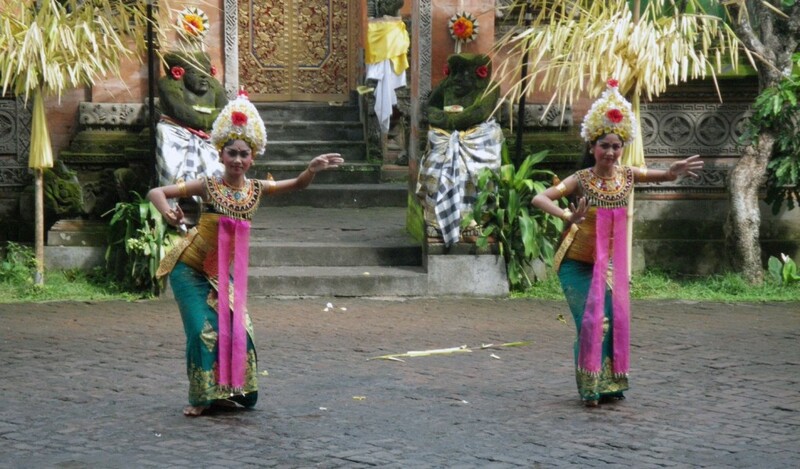 We also managed to squeeze in a batik making factory and a balinese dance ceremoy (of course they were tourist traps, but we had our guide to whisk us away when we were ready). A long day but well worth it, and his prices are very decent. In addition to doing private transport, he’s also got a beautiful guest house, just completed this year for a very good price as well. Yesterday, was saturday. We spent a good part of the day on the phone with the airlines trying to change our flight, which was useless. Basically we learned that you will be screwed if you try to fly into a city and out of another. We have to forgoe our entire flight home and just pay for a new one way ticket. That is the cheapest way. ReDICulous. Later on, we attempted the waves. Our friends (who have been surfing here for weeks already) are more experienced and eager to get out in front of the hotel. We decided to share a board and test ourselves out there. Neither of us lasted long, it was a battle and a half to just get out there past the break. I caught 3 whitewashes, and Josh caught a couple short ones and then we called it a day. Surfing, I’ve learned, is an amazing sport. Its’ definitely the toughest thing I’ve ever tried to do, and one must be in the right mindset, I think, every time you go out, in order to succeed and learn. Patience and perseverence is the key, and I’m not sure I have that at the moment. We are kind of wishing for our Punta de Mita waves out front because these ones are mean and nasty compared to those. Today, sunday, our biggest event was renting a scooter (yes mom, with a helmet, a good one) and going into town to do some outlet surf shopping. Rip curl, billabong, and other surf brands for pretty good discounts along the way to Kuta. Surfing didn’t win with us today, I didn’t bother going, and Josh’s attempt was short lived. Later we’ll head Seminyak, perhaps to try out the Bali Cafe.